A kleptomaniac stealing from a store. The definition of a kleptomaniac is someone with an abnormal urge to steal. 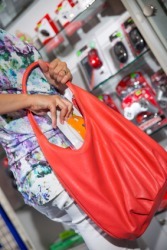 An example of a kleptomaniac is someone who goes from store to store stealing items they don't need or want. "kleptomaniac." YourDictionary, n.d. Web. 09 April 2019. <https://www.yourdictionary.com/kleptomaniac>.